Lauderdale Marine Center in Fort Lauderdale, Florida, notches about 1,500 boater visits a year, and the average boat stays for a period of two months. It is a popular 65-acre facility that draws boats from throughout South Florida, the rest of the U.S., and around the globe. But the facility’s management saw a need to focus on an underserved target base. In the past, on any given day the boats docked at Lauderdale Marine Center might have ranged from 40- to 200-foot length overall, but about 70 percent of the dockage and space at Lauderdale Marine Center was dedicated to vessels under 80 feet. “Our focus is on the recreation vessel market,” said Doug West, president of Lauderdale Marine Center since October 2015. “We had demand from the 80-foot to 150-foot range that we couldn’t fulfill.” So, over the past two years, Lauderdale Marine Center has carried out a far-reaching $20 million renovation plan aimed at making the facility a leading destination for recreational boaters of larger vessels from near and far. The summer of 2016 saw the launch of a spate of renovations at Lauderdale Marine Center. It added five hard spaces of 150-foot length overall in August. Additionally, the facility installed two new lifts, one for vessels up to 220 tons and the other travel lift for vessels up to 485-ton (one of the largest in South Florida). The lifts have been in operation since July 2017. 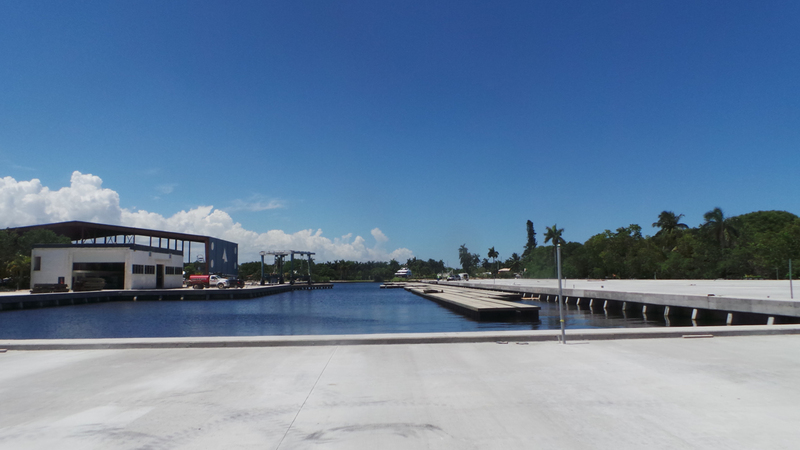 The western working yard of Lauderdale Marine Center was reconfigured to accommodate 17 vessels of up to 130 feet. Along with that, Lauderdale Marine Center upgraded the electrical systems on the slips. A key part of realizing the new vision for Lauderdale Marine Center was the acquisition of Riverbend, an adjoining 15-acre facility that offers dockage space for large vessels, as well as a site for office space. Over the course of this year, Riverbend has been outfitted with a concrete working yard, new floating docks, and a haul-out pier. Many of the renovations at the site, including dredging 3,000 to 4,000 cubic yards of sediment from the marina, repairing the existing seawalls, installing 450 feet of new seawalls, and relocating a pier to accommodate one of the new lifts, was completed by B&M Marine Construction Inc., a firm based in Deerfield Beach, Florida. B&M Marine Construction also worked on renovations at the main facility. At Riverbend, a 2,000-square-foot office building was opened, and an existing 4,000-square-foot workshop was refurbished. The restored Riverbend property opened in early October 2017. It now accommodates 35 in-water vessels and 42 vessels on the hard with lengths up to 80 feet. Strategically, the Riverbend acquisition enables Lauderdale Marine Center to maintain its presence in the marina market for vessels below 80 feet, allowing the main Lauderdale Marine Center property to focus increasingly on the needs 80- to 200-foot vessels. Amid the renovations, Lauderdale Marine Center has positioned itself as a hub for international vessels. Over the course of a year, Doug West and the leadership team at Lauderdale Marine Center worked with the U.S. Border Patrol, the Foreign Trade Board, and the Marine Industries Association of South Florida to secure the designation for Lauderdale Marine Center as a free trade zone (FTZ). The permanent designation, which Lauderdale Marine Center has since received, affords unique benefits. One way the designation helps is by easing the process of foreign vessel sales. The FTZ allows foreign flagged vessels to be advertised for sale to U.S. citizens without having to leave the docks. When it comes time to finalize the sale, the FTZ means the buyer and seller also can close the transaction on the docks at Lauderdale Marine Center, instead of having to cruise out to international waters to do so. In general, the main benefit of FTZs is the simplification or avoidance of import duties, so foreign builders can bring in inventory without paying duties upon entry. In fact, foreign builders can actually recoup most of the duties paid on goods previously imported into the U.S.
Growth begets its own challenges. At any given time, vessels at Lauderdale Marine Center range from 40 feet in length overall up to 200 feet. Both the size of the facility and the diversity of the customer base could strain logistics and planning. During a single visit a boat might move from in-water dock to the repair shop, then to dry dock storage, and then back to a different slip in the water. 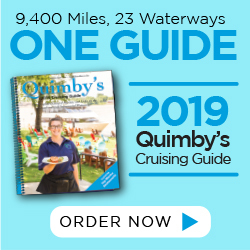 In the past, this required the boat to have multiple reservations as it moved from one part of the facility to another, crisscrossing Lauderdale Marine Center. West acknowledges that the multiple reservations used by the previous software system was inefficient. He also wanted to gain more data about customers, such as length of stay, visits per year, revenue per visit, occupancy levels, and other metrics that could improve planning and maximize revenue. So early this summer, West and the Lauderdale Marine Center team began working on a new marina software system. Built on the SalesForce platform, Cloud Marina bundles three core functions that ease marina planning at Lauderdale Marine Center. It daily tracks occupancy levels and slip utilization by category (Lauderdale Marine Center uses five different tiers based on length overall) daily, monthly and year-to-date. From there it compares the figures to the annual budget and metrics from previous years. The software is also capable of tracking the number of hours it takes to complete a job and has other features designed to track efficiency. Finally, the operating system, accounting system and customer relationship management system, all communicate with each other. Now, after four months of trials and tailored improvements, the Cloud Marina system went live in November. Today, Lauderdale Marine Center glistens thanks to the new lifts and extended docks, while the acquisition of the Riverbend property and Cloud Marina software system ensures that boaters have their needs met efficiently. Already this has boosted its share of large vessels. Whereas a few years ago, 70 percent vessels were under 80 feet in length overall, today the majority are above that size. Still, more changes are on the horizon at Lauderdale Marine Center. In early 2018 Lauderdale Marine Center will undertake a marina reconfiguration. B&M Marine Construction will demolish all the existing floating dock systems, reconfigure the docks with a different shape, and install new concrete floating docks manufactured by Bellingham Marine. After this, the facility will be able to host 20 more vessels between 100 feet and 180 feet in length.